Seamus Heaney is everywhere! I've just finished Stepping Stones and at present I'm listening to the Collected Poems on CD thanks to Navan Library. I've got as far as Field Work. He appears as part of the Dublin Writers Festival in the National Concert Hall, Dublin on 2 June. 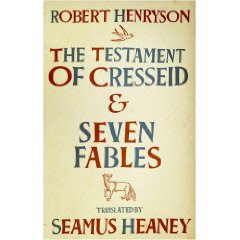 His next book is a translation The Testament of Cresseid & Seven Fables by the fifteenth century Scottish poet Robert Henryson translated from the Scots, published by Faber (£12.99) on 11 Jun. Heaney has an article on the project in yesterday's Guardian and the Guardian's Saturday Poem is an extract from the work. On a visit to Kilkenny city recently I came across this public sculpture in Parliament Street. You just suddenly come upon it, unannounced, and you have to look at it twice to make sure that it's not just normal street furniture. A most striking head, made of stone with a simple bronze band around it. It looks so solid and permanent and confident of its own importance. A nice position, I thought, in front of a bank. 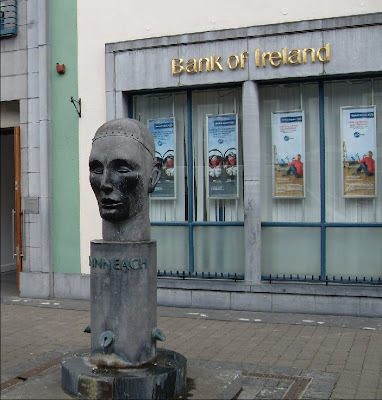 The sculpture is called Cainneach (Saint Canice - patron of Kilkenny) and it was made by Spanish sculptor Saturio Alonso in1999. "This sculpture is made of Kilkenny limestone and Bronze. Kilkenny is named after Saint Canice who was born in 514 AD. The sculpture is a symbol of Celtic mythology and the head is the symbol of spiritually" - Information on the County Council website. Any sentence which includes "symbol" "Celtic mythology" and "spirituality" makes my eyes glaze over and my dander rise if both can happen together. Sculpture should be about solididy not something vague called spirituality. The sculptor, Saturio Alonso, was born in Spain in 1954 and currently lives in Ireland. His background is as a painter and graphic designer. He was a member of the group El Cubri in Spain until his move to Ireland in 1980. He is a founder member of Artcore, a mentor in KCAT, Callan Co. Kilkenny and his work can be found in various public spaces around Ireland and in private and public collections in Europe and America. Some people will do anything for publicity! See the picture and article in this week's Meath Chronicle. Swift Festival in Trim 2 - 5 July 2009. Satire competition closing date is Friday 5 June. Details here. Disappointing result last night. I've been a Manchester United supporter since 1958. 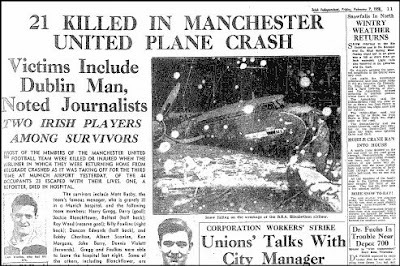 I remember reading about the Munich crash in the Irish Independent the day after. I remember the disappointment when they were beaten 2-0 by Bolton in the cup final that year. Nat Lofthouse bundled Harry Gregg, the United goalkeeper, plus ball into the net for the second goal. I remember Saturday evenings waiting for the BBC Sports Report at five o'clock to hear all the results, a litany in a perfect English accent. I remember United players like Albert Quixall and Dennis Violett. Favourite United player of all time? Bobby Charlton. Great goal here on YouTube. George Best? He had his moments. I remember watching the 1968 European Final in the TV room in St Pat's, Drumcondra. I think it was in the middle of exam week and there was a small group of United supporters there. I have never actually attended a Manchester United game but now I'm retired it's something I have to do. Thought for the Day: As you get older more and more of your sentences start with "I remember". So even more problems with the Oxford Professor of Poetry position. Ruth Padel has resigned, a step which seemed inevitable one it was revealed that she alerted journalists to the allegations against one of her rivals, Derek Walcott. Reports on the Guardian website here and here. Either poet would I think have made a fine professor. As well as Ruth Padel's poetry her books on reading poems based on a newspaper column provide great insights to reading and writing poetry. A field day for conspiracy theorists of course. Poet Jackie Kay is quoted as saying "The old boys have closed in on her. It would not have happened to a man, and I am very sad". What about Walcott - didn't he have to drop out of the race? 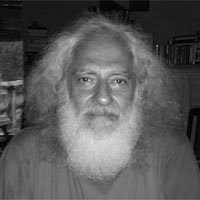 The forgotten man in all this is the third candidate for the position, Indian poet, Arvind Krishna Mehrotra (picture right). Usually described as "little-known" in British newspapers this merely means that we know little about him. He is in his 60s, has published numerous books of poetry, has edited literary magazines and held teaching positions. Guardian article on him here. George Szirtes has a nice comment on the whole affair in his posting. A panorama of Thursday night's reading in the Village Hall, Knightsbridge. Picture and stitching by Paddy Smith who also acted as MC for the night. Multi-talented. Spot who was asleep during my reading! Today is Bob Dylan's birthday. He was born in 1941 so he is 68 today. An article from the health section of the Irish Times earlier in the month entitled Are you tired of feeling tired all the time? with reference to Dylan's "amazing energy". 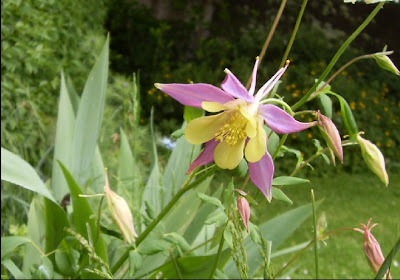 Aquilegia pictured in the garden this morning. Gardeners are divided into two camps- those who see the weeds in a garden and those who see the flowers. I belong to the latter I hope. Jimmy Reynolds from Trim, who developed Butterstream Garden here (now alas closed), had a saying which might be a quote from someone else about it being important to look at the flowers not the weeds in a garden. Plenty of weeds at the moment thanks to the rain. Lots of nice gardening quotes here. Jimmy Reynolds has been immortalised by Trim novelist Patrick Dunne as his hero Illaun Bowe's gardener boyfriend in his series of novels featuring that archaeologist. I've just finished A Carol for the Dead which is based on a gruesome find near Newgrange. A great page turner! Anyway the aquilegia are blooming at the moment and the peonys should be next. I always found that our garden was past its best by July and was very plain for the reast of the year so taoday I'm putting in Dahlias and Gladlioli - they should provide colour later in the year. A very enjoyable Reading and Open Mic session in the Knightsbridge Village Hall last night. The audience was similar to our first night, about 35, and we had 12 readers in the open mic. Paddy Meegan, the Meath football legend, was the first to read and he gave a delightful reading of a short story slightly adapted from his recently published book "From the Life Around Me". The audience was enthralled at the clear well constructed story which gave a vivid glimpse into life in Meath all those years ago without any trace of sentimentality. I was the second featured reader. I read nine poems which were well recieved. I have decided that the audience needs to be told quite a lot about poems before they are read - they hear them only once, no chance to reread. This means that while they know in general what the poem is about you hope and expect that they will be suprised and delighted by the way it is expressed. The open mic readers read prose and poetry, all very interesting and well recieved. It was nice to see that some of our friends from LitLab have travelled from Cavan and some of the Mullingar Scribblers also attended. Paddy Smith proved a most genial and efficient host and only used used his timing bell once! Boyne Writers Group is delighted that this venture seems to be a success and is filling a need in the area. There was a great feeling of fellowship among writers there, writers reading to writers in the main, plenty of applause and congratulations - an encouraging and refreshing night. Navan based poet Tom French has an interesting reference to Paddy Meegan in a poem (the bottom of the page) in a selection of poems in the Manchester Review. There is an article here on Paddy in a recent Meath Chronicle. 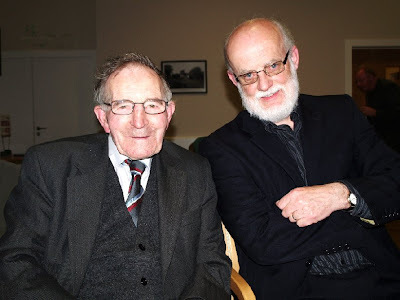 Picture (by Paddy Smith) is of Paddy Meegan and myself at the reading. This evening the second Boyne Readings and Open Mic event takes place. The featured readers are Paddy Meegan and myself. Paddy Meegan will be reading extracts from his book ‘From The Life Around Me’ which includes reflections on modern life, recollections of people he knew and incidents from his eventful life. And he has had an eventful life because he is now aged 87 and was on the famous Meath all-Ireland winning teams of 1949 and 1954. I have finalised a list of poems to read. 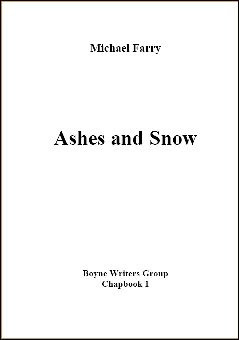 I thought it a good idea to have available a small chapbook of my poems for the reading so our friends in ePrint have produced Ashes and Snow containing nine of my poems which have been published in small magazines. It's a nice idea and is relatively easy and cheap to produce. I regretted not having something like this at the WhiteHouse reading in Limerick. Let's hope we a get as good a crowd tonight as we had at the May Reading. The Village Hall, Knightsbridge Complex, Longwood Road, Trim 8pm. A recent post about a public sculpture in Dun Laoghaire reminded me that Liverpool has a large number of public sculptures. Above is one of the most original of them, situated half way up Hope Street. 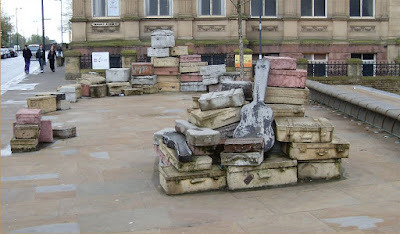 The sculpture A Case History (1998) was designed by sculptor John King and it shows 27 suitcases and bags in concrete - all have luggage tags with the names of famous people who had some connection with the city and the area. These include McCartney, Lennon and Harrison and also Stuart Sutcliffe, an early member of the Beatles, but also comedian Arthur Askey, author Charles Dickens and conductor Malcolm Sargent. One of the "cases" is a package from the publishers Faber addressed to the Liverpool Poets: Adrian Henri (1932-2000), Roger McGough (b.1937) and Brian Patten (b.1946). A noticeboard alongside this public art installation has a numbered diagram giving information about the people to whom the suitcases and packages 'belong'. More details here. I thought of the suitcases at Auschwitz piled high on display. Maybe the artist wanted us to make the connection. I also thought of the large number of immigrants from Ireland who arrived in Liverpool in the past, some to stay, some to move on to America. Again this may be an intended reference. Suitcases can mean so many different things - from emigration to holidays - that they are very powerful symbols. But is it art? Poet Ruth Padel has won Saturday's formal ballot to become Professor of Poetry at the University of Oxford. The former Chair of the Poetry Society is the first female post-holder in the 300-year history of the role. She defeated Indian poet Arvind Mehrotra, who is currently professor of English at the University of Allahabad. The Nobel prizewinner, Derek Walcott, withdrew from the race last week after an anonymous letter campaign against him. Documents containing details of a sexual harassment claim made against Walcott by a Harvard student in 1982 were sent to between 100 and 200 of the 150,000 Oxford academics and graduates who are eligible to take part in the vote. There is no suggestion that Padel or her supporters were behind the campaign. List of recent Guardian articles on the affair here. Irish Times article here. The relevant page on the Oxford website. Guardian interview with Ruth Padel. Ruth Padel takes over from Christopher Ricks. Christopher Ricks published a book on Bob Dylan while Professor of Poetry. Previous people to hold the position include Matthew Arnold, W H Auden and Seamus Heaney. The BBC have a poetry season on at the moment on radio and TV. The website is here. Unfortunately none of the video content of the site is available in Ireland - "Not available in your area". It's running a poll on the site -"Who is the Nation's Favourite Poet?" presumably the nation in question is the United Kingdom/Britain/Great Britain. The shortlist of 30 poets was compiled in consultation with The Poetry Society and The Arts Council and seems to be "British" in a broad sort of way. Thus it contains both Eliot and Sylvia Plath, Yeats and Heaney. Both "Irish" poets were born in the United Kingdom of course. So "the nation's favourite poet" can't be Walt Whitman or Rainer Maria Rilke. I was able to vote a number of times in this though I think there is a limit to the number of votes allowed from each IP address. I voted for Yeats of course! There is a misspelling on the Yeats page - "WB Yeats reads his own poem, The Lake Isle of Innesfree" though in the text further down the island is correctly spelled. In the Yeats biography there is this lovely awkward sentence which reads like it was agreed as a compromise by a committee of Anglo-Irish civil servants after lengthy discussion - "In his poem Easter, 1916 he commemorates the passing of the men he knew who died during the Easter Rising." The National Library's Life and Works of W B Yeats online resource is well worth a visit - the BBC site has a link to it. The BBC site also has a list of the programmes in the series. I watched a repeat of a programme on Ted Hughes last night - excellent with input by Heaney and Al Alvarez. Many of the programmes are on BBC 4, available on Sky as an additional channel but you can't record from it on the Sky box. The garden is thriving thanks to the rain. In the foreground the chives have flowered. 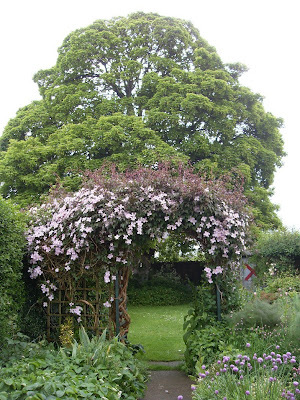 The clematis on the arch is in full flower, though it has fewer flowers than last year probably because I cut it back last autumn. The arch was originally wooden but it was blown over two years ago so now there are metal uprights supporting it. It also has honeysuckle which will bloom later. The clematis is a vigorously growing plant with no where to go. I did extend a trellis to the right and allowed the clematis to grow along it but it also was a casualty of the storm and was not rebuilt. It did block the full view of the garden from the kitchen window. There are two views (!) on gardens, 1. you should be able to see everything from the kitchen window and 2. the kitchen window view should be a taster which tempts you outside to explore the garden. I hold the latter view. The sycamore tree is in full flower also though the flowers being green are difficult to see. Under the tree the bluebells are to the right but the cow parsley is head-high on the wild patch. Trim poet Tommy Murray, has a good description of "lace curtains of cow parsley" in a poem on this page. The red X at the bottom of the garden came from railway gates at a closed west of Ireland railway station. It's amazing what you find on the internet! 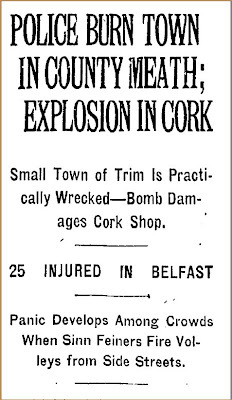 Searching for material for a talk on The Black and Tans to some post-primary pupils at the weekend I found this article on the burning of Trim in 1920. The amazing thing about it is not its content but where it was printed - the front page of the New York Times on the Tuesday following the event. The police barracks in Trim had been burned by the IRA on the Sunday morning and on Sunday night/Monday morning lorries of Black and Tans arrived and burned a large part of the town. No one was killed in either action but the bad publicity which resulted for the British side as a result of this and similar reprisals during 1920 is well illustrated by the prominence it received in America. The propaganda value of such events for the Irish rebels was great and was one of the reasons why the British eventually agreed to a Truce and then to the Treaty. The New York Times archive is here. It seems that content before 1921 is free as it is deemed in the public domain but there is a charge for articles after 1921. More material on the Black and Tans here. 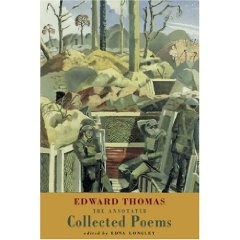 Reading at the moment: Edward Thomas : The Annotated Collected Poems edited by Edna Longley published by Bloodaxe. Edward Thomas (1878-1917) was 37 when he enlisted in 1915; unlike some of the younger war poets he had a wife and two children when he decided he could no longer sit out the war and enlisted. Edna Longley's revised edition of his poems, has nearly 200 pages of notes to just over 100 pages of poetry. She uses chunks of quotations from Thomas's voluminous prose works and from his letters to give the backgrounds and sometimes the sources of the poem. One of Thomas' most famous poems is Adlestrop - it's the one about the express train stopping unexpectedly at a railway station. Read it here. He was killed the day after Easter in 1917. Guardian review of the collection here, the London Times review here. The Edward Thomas collection homepage of the First World War Poetry Digital Archive. Interesting comparison between Thomas and Hopkins on this page which contains a link to Robert Pinsky reading a Thomas poem. 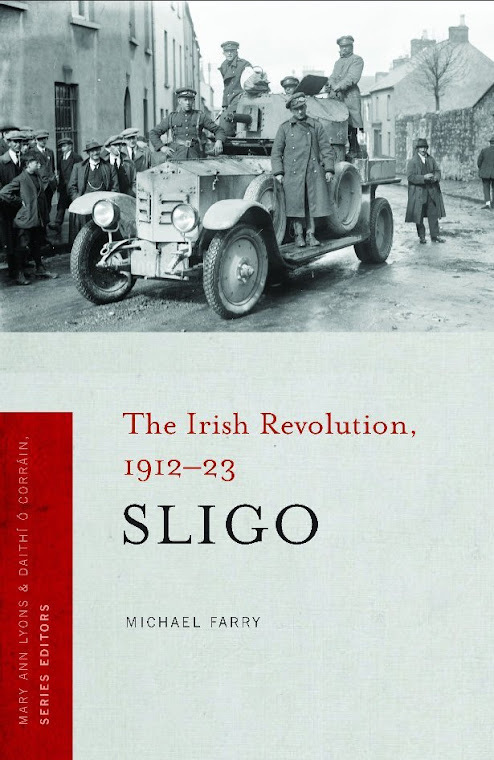 Windows Publications: book launch and prize giving ceremony in the Cavan Crystal Hotel, Cavan on Thursday 14th May (today) at 8pm. The Launch of 'Towards a Wilderness…' a new fantastic anthology of young people's writings. Hosted by Editors Heather Brett & Noel Monahan, introduction by Jack Keyes, Cavan County Manager. Finger food and refreshments served. All welcome. 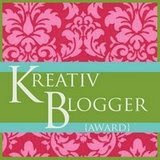 An award from poet, editor, creative writing tutor etc Barbara!! The challenge is to list seven things you love. I interpret "things" strictly - no humans or animals. In no particular order - Granite, Fountain pens, Sherry, Paper, Marmalade, Words and Brick. A very interesting article by Irish poet, editor and public servant, Dennis O'Driscoll, in this month's Poetry. In it he talks about his career with the Irish Revenue Commissioners, the status of poets and poetry in Ireland and the tax exemption scheme for artists (including a swipe at Bono). Read (and comment on if you wish) the full article here. The rest of the magazine concentrates on longer poetry, including excerpts from Ilya Kaminsky's “Deaf Republic” and Hanoch Levin's “Lives of the Dead.” It also has a selection of poetry from recently deceased Danish poet, Inger Christensen. Public sculpture, especially if it is not a "statue" is sure to upset a number of people. Thankfully we have seen a great increase in the number of public sculpture around the country many, also thankfully, the causes of controversy. If no-one objects then there must be something wrong - public art should be controversial. 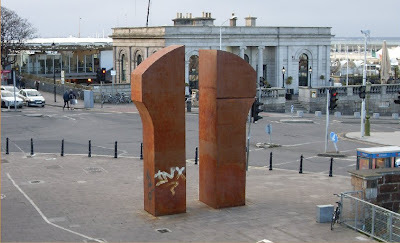 The Gateway sculpture in steel by Michael Warren at Dun Laoghaire has been removed at least for a time. There are those who would not like it returned. Anyone who attended the Dun Laoghaire Poetry Now Festival has seen the work and Poetry Ireland used it on the cover of their recent issue which featured some of the Dun Laoghaire poetry performers. The Irish Times Makes Amends! Yesterday's Irish Times seemed determined to make up to Dylan and his admirers for the woeful review earlier in the week. They printed a complaining letter about the review with a letter about bad acoustics in the O2, letters here. They also had an article on oldies in pop and rock which was based on Dylan's new album making No 1 - article here. And then the heavyweight commentator, Fintan O'Toole, had a long detailed discussion The Songs they are A'Changin' on Dylan and his concert. (I saw O'Toole at the first Dublin concert). "His greatest songs are stitched in to the language and consciousness of our times in the way that was once true of the grandest epic poems. And we hear them now in performance as if from their deathbed. . . . What’s haunting is that Dylan doesn’t make the songs new, he makes them old." 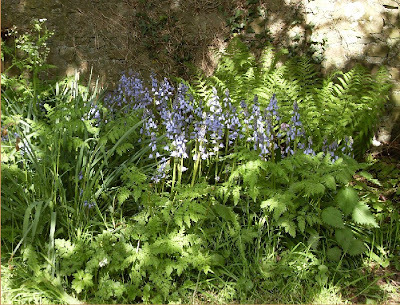 Bluebells in a shady corner under the sycamore tree in our garden. Ferns in the background. A treat this time of every year. There are not the common bluebells but Spanish bluebells or possibly a hybrid. I think I remember planting the common bluebells here first then the Spanish bluebells. Plenty of bluebell poetry. The Bronte were very interested, a bluebell poem by Emily Bronte here and one by Anne Bronte here. I wonder if they are actually writing about what is called the harebell, sometimes the Scottish bluebell, which is often confused with the bluebell. We certainly confused the two in my youth. Submissions will be accepted for Boyne Berries 6 (September 2009) and Boyne Berries 7 (March 2010) during May, June and July 2009. Closing date 31 July. Material for the two issues will be chosen from these submissions. Poetry: Send no more than three poems. Each poem should be 70 lines or under. Prose: Stories etc should be under 1000 words. submitted or accepted for publication elsewhere. You must include a brief biography (two or three lines) as you would like it to appear in the magazine. 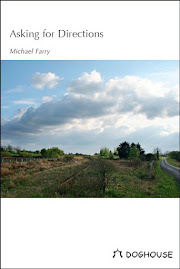 You must also include a postal address for contributors copy. Submit your work by email to: editor@boynewriters.com This is our preferred method. However we will accept submissions by post to: Boyne Writers , 33 Avondale Drive, Trim, Co. Meath, Ireland. Include an email address where possible. What amazes me each submission period is the number of writers who don't follow the simple rules. We ask for three poems only, some send more - up to twenty. We ask for a brief bio, some send none, others send half a page. One would think that writers who presumably take great care with their written work would also ensure that they follow the guidelines. Recovering from two Dylan concerts in O2 Dublin. My first visit to the venue. A great improvement on The Point, good view of the stage from most areas, pity about no parking at the venue. We used the Luas both nights and there are plans to extend it to the O2. That will make a difference. Picture above by Greg from the first Dublin concert, thanks! Good company each night, friends first night, relations second. But Dylan? Great both nights. Why go to two concerts one after the other? He played 17 songs the Tuesday night, 18 the Wednesday and between the two night i heard 28 different songs. Great set lists both night. First night highlights included Masters of War, Ain't Talking, John Brown and Stuck Inside of Mobile. The big news from Dublin was that Dylan played the first live version of a track from his new album - If You Ever Go to Houston - on Tuesday and repeated it on Wednesday. Second night we heard a powerful Desolation Row, Blind Willie McTell, Girl of the North Country and Man in the Long Black Coat. He finished each night with a new arrangement of Blowing in the Wind. One of the teases of attending a Dylan concert is recognising the familiar songs because they certainly don't sound like they do on the albums or even like they did the last time you saw him. Bob said nothing either night, no "Hello", no "Thanks" and no band introductions. The rumour is that he and his band had a falling out at the Edinburgh gig and since then he hasn't introduced them. He did do the introductions at Liverpool. Having said that the band sounded terrific. Is that his real Oscar which perched on an amplifier each night? He won the Academy Award for Best Original Song in a movie for "Things Have Changed" for the movie Wonder Boys in 2000. Irish Independent review here. The Wednesday night was the last night of his current European tour. He starts an American tour on 1 July. His new album, Together through Life, has reached number one in the charts. The Guardian runs a series on writers rooms where they ask a writer to comment on his/her room and include a photograph by Eamonn McCann. McCabe's photographs have just been put on exhibition at the Brontë Parsonage in Haworth, West Yorkshire, in the rooms where the sisters wrote. The exhibition previously was on show in London. A slideshow here. The same kind of thing here from Vancouver. 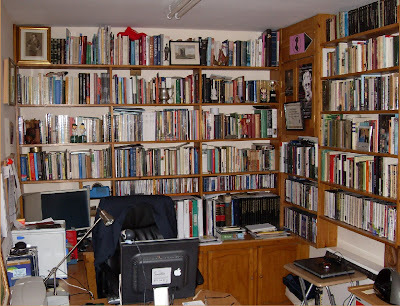 Above is a picture of my writing space. Can you spot Yeats, Chaplin, Jonathan Swift, Dante, Alice Terry, Ian Botham, Jane Austen? 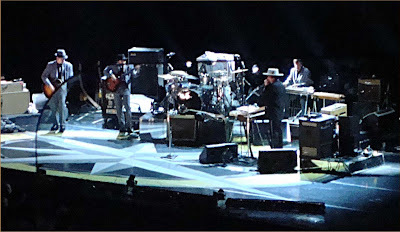 Bob Dylan last night in Dublin and again tonight - blog tomorrow. Trim, where I live, has a statue on a column of the Duke of Wellington because his family owned land nearby and he may have been born here or on the way to Dublin or in Dublin. I didn't know Liverpool had a similar column in his honour until I visited last week. The plinth is inscribed with the names of his victorious battles including Waterloo where he defeated Napoleon. When I visited the nearby Walker Art Gallery I saw a painting of Napoleon Crossing the Alps by Paul Delaroche (1797-1856). This was painted in response to the romantic picture of the same name by French artist Jacques-Louis David (1748–1825) where Napoleon is idealised pointing the way forward on a rearing horse. In the Liverpool painting the great Emperor crosses the Great Saint Bernard Pass on a mule borrowed from a local and led by a Swiss peasant. In Tate Liverpool the following day I saw René Magritte's The Future of Statues (1937). This sculpture consists of a commercial plaster reproduction of the death mask of Napoleon which has been painted with sky and clouds. Pupils' reaction to The Future of Statues. And if you really want to continue the trail: in the eighties video made for Dylan's Jokerman song the final image is a reworking of Magritte’s work with an animation of Dylan’s muted profile, layered with Magritte-like clouds. You can see the video on YouTube here. Information about the making of the video here. What does it all mean? Something about the infinite number of possible connections. I am never surprised by so-called coincidences. Some very positive comments about writers groups from overall 2008 Hennessy XO New Irish Writers Award, poet David Mohan, in Saturday's Irish Times. He belongs to Lucan Creative Writers Group. 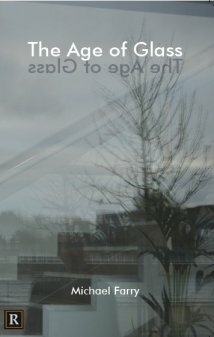 In a recent post I quoted some of Dennis O'Driscoll's questions for Seamus Heaney from Stepping Stones about The Group. Here they are again with the first sentences of the answers by Heaney. Italics are as in the book. Was there rivalry in The Group? Not exactly in The Group. It was more that the consequences of The Group ratings had to be lived with outside it. Would you describe the rivalry as having been at all times healthy? I don't think the rivalry, if that's the right word, was ever unhealthy in the matter of writing, in the sheer aspiration to best yourself. Interesting. Writers groups can be very positive and helpful. It can and should be a great help to a aspiring writer to have a sympathetic audience to listen to the work and offer comments. Trust has to be built up of course and comments must be positive as well as negative. There are dangers. The group must allow and accept differences of style and approach. The group must not seek to impose a "group style". In the end a writer must have confidence in his/her own work and must avoid being unduly influenced by other writers. There are two great cathedrals in Liverpool, one or other visible from most parts of the city centre. Liverpool Cathedral, the Cathedral Christ of Christ, is the Anglican cathedral. Its foundation stone was laid in 1904 and the building was finally finished in 1978. About half a mile away at the other end of Hope Street is the Catholic Cathedral - the Metropolitan Cathedral of Christ the King built 1962 - 1967. Both are equally impressive but very different considering both were built in the last ventury. The Anglican cathedral is one of the largest cathedrals in Europe. It is full of discrete spaces. The Catholic cathedral is full of the new spirit of the liturgy and the church after the Second Vatican Council. It gives the impression of one large communal space full of light from modern stained glass windows. In fact as you walk round there are numerous side chapels. The large statue of Christ over the entrance to the Anglican cathedral and the Christ on the crucifix in the Catholic cathedral are both the work of English sculptor Elizabeth Frink. About half way up Hope Street (Named after a Liverpool merchant not the theological virtue!) 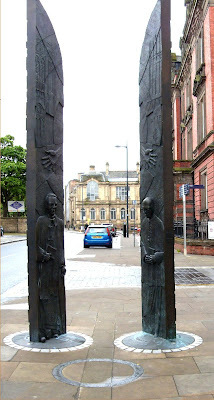 between the two cathedrals is a sculpture, the Sheppard-Worlock Statue, in the form of two Bronze Doors which commemorates two recent Liverpool Archbishops Derek Worlock (Catholic) and David Shepherd (Anglican). This was unveiled in May 2008. Wikipedia entries for the cathedrals- Anglican, Catholic. Typically Bob Dylan gives no sign that he is aware of where he is playing - no "Hello Liverpool!" or "It's good to be in Dublin" but that doesn't mean he isn't aware. I saw him play the 11,000 seater Echo Arena in Liverpool last night. Chatting with the people on either side of me before the concert I wondered if Bob would play anything for George Harrison, this presumably being Bob's first concert in Liverpool since George's death in 2001. I speculated that My Sweet Lord might fit the bill. They doubted. But at number 12 in the 17 song setlist Bob delighted the audience by singing George's Something - one of the high points of the concert. Other highpoints in what was a very lively Dylan performance were the second song Don't Think Twice, Po Boy and It's All Right Ma. He finished with a non-anthemic version of Blowin in the Wind. He only took up the guitar once for - Boots of Spanish Leather, played keyboards for the rest with a lot of harmonica thrown in. Nothing from his latest album. No talk except band introductions. Full setlist here. He moves on to Scotland and then to Dublin on Tuesday and Wednesday of next week. Something special for Dublin? Probably not but what about the first live performance of I Feel A Change Comin' On from the new album with the "I'm reading James Joyce" line? In Liverpool since yesterday. Some facts about Liverpool. The city centre is small and seeable on foot. It rains a lot in Liverpool. The museums and art galleries are very interesting. There are not many internet cafes. Yesterday after the two Cathedrals the Walker Art Gallery. A feast of wonderful art, especially strong on pre-Raphalites and Victorian though a nice early Rembrandt self portrait as well. I particularly wanted to see Dante and Beatrice by Henry Holiday a copy of which was on display in the hotel in Florence I stayed in last year. Here it is, well observed, colourful but lifeless. Today the Tate Liverpool and the Museum of Slavery. The This is Sculpture exhibition at the Tate was an unexpected pleasure, three rooms of a eclectic selection of modern (some not so modern) sculpture including works I was familiar with only as illustrations in books. Modern sculpture is full of interest, humour and intrigue. The gallery was full of school children examining, laughing, joking and working under teacher guidance. A great experience. Highlight? Possibly Michael Craig-Martin's An Oak Tree. A glass of water is on show on a high glass shelf and an interview with the artist is printed beside the exhibit. See it here. But is it art? Tonight Bob Dylan at the Echo Arena, Liverpool.